The Pandavas wanted to kill Ashvattama for the merciless manner in which he had killed their dear ones in the middle of the night. Draupadi was devastated since all her sons had been killed by Ashvattama. The Pandavas wanted revenge and searched for him and finally found him in Sage Vyasa's hermitage. 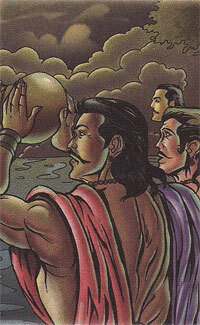 Bhima fought a duel with Ashvattama and the latter finally accepted defeat. The war finally ended after eighteen days. Dhrithrashtra was devastated when he heard that Duryodhana had died. He was also furious when he heard how Ashvattama had killed Draupadi's sons. Vidura and Sage Vyasa consoled Dhrithrashtra by saying that the war had to happen. Gandhari too was very sad but blessed the Pandavas, who had emerged victorious. Finally, the Pandavas went to the banks of the Ganga to perform the last rites of those who had lost their lives in the war.